Intel has rolled out a new ultra-high-end Core i9 processor for laptops, as well as mainstream Core i7 and Core i5 models, bringing its 8th Generation Coffee Lake architecture to more product segments. The new processors feature up to six cores, which is a first for the company’s mobile lineup. Intel is aiming these processors at high-end laptops designed for gaming and content creation as well as VR and mixed reality applications. At an event in Beijing, Intel unveiled its new flagship Core i9-8950HK laptop processor, which is claimed to offer the best single-core performance for better frame rates when gaming, and also the best multi-core performance for heavy applications. In a demo of the upcoming game Conqeror’s Blade, Intel showed how all six cores and 12 threads are utilised when gaming and live-streaming. The company promises better physics for characters as well as equipment, new AI that can handle larger armies for epic battles. The Core i9-8950HK processor has six cores with Hyper-Threading for a total of twelve threads, and a 12MB cache. Its base clock speed is 2.9GHz and it has a maximum single-core Turbo Boost speed of 4.8GHz. Intel is also debuting a new feature called Thermal Velocity Boost, which opportunistically raises the clock speed of the CPU if the thermal and power conditions are suitable at any time, much like the automatic XFR feature that AMD Ryzen processors offer. Dual-channel DDR4-2666 RAM is supported. The Core i9-8950HK is based on the same Coffee Lake architecture as the mainstream desktop 8th Gen models, rather than the beefier Skylake-X architecture which all desktop Core i9 CPUs are based on. It is fully unlocked and overclockable. Intel claims up to 41 percent better gamplay (in terms of frames per second in Total War: Warhammer II) and up to 59 percent faster 4K video editing, compared to the previous-generation Core i7-7820HK processor. Intel claims that the premium laptop category has grown 40 percent year-on-year, and so it intends to cater to a wide range of purpose-built laptops. The company has also launched the new six-core Core i7-8850H and Core i7-8750H, the quad-core Core i5-8400H and Core i5-8300H, and the six-core Xeon E-2186M, Xeon E-2176M processors for mainstream and workstation laptops. All these new processors will work with Intel’s Optane Memory to speed up launch and load times across software. 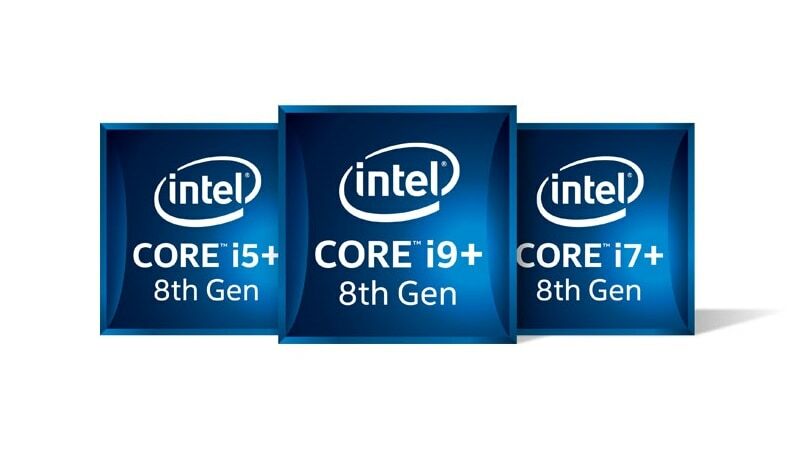 Intel is rolling out new Core i9+, Core i7+ and Core i5+ badges for OEMs to promote desktops and laptops that use a Core CPU as well as Optane Memory. In addition, Intel is also now offering its 8th Generation desktop and mobile Core processors as well as Xeon models with its vPro management technology suite for business users. The vPro platform allows business owners to remotely manage large deployments of PCs used by employees. Additional capabilities touted by Intel include hardware-based biometric authentication and encryption, secure booting with malware protection and BIOS integrity verification, and identity theft mitigation. Thin-and-light laptops with 8th Gen processors and vPro will be available first, followed by mainstream laptops, desktops, and workstations. On the desktop front, there are three new standard-voltage processors: the 65W Core i5-8600 and Core i5-8500, and the 62W Core i3-8300. Along with these are six other 35W models intended for small-form-factor or OEM PCs, spanning the range from Core i3 to Core i7. Finally, the company is extending its desktop chipset lineup to include a mid-range option for buyers who don’t need overclocking. The new H370 and H310 platform controllers are suitable for Intel’s multiplier-locked 8th Gen Core i3 and Core i5 processors and will reduce the cost of building a new PC. The new B360 and Q370 are intended for business users. Up until now, Intel had only launched the high-end Z370 chipset for 8th Gen desktop CPUs, which meant that users had to spend more than necessary for capabilities they would not be able to use. Motherboards from Asus, Gigabyte, MSI, ASRock and other partners are already making their way to markets.